Belonging to the Vigneti line, Patricia is 100% Pinot Noir grown on the south-west facing slopes of Mazzon, above Egna, where winegrower Mrs. Patricia Von Elzenbaum runs the “Astmayer-Hof” vineyards. Clay and lime soils are ideal for Pinot Nero, conveying softness and an elegant structure. Complex with fragrance layers scents of earth and black raspberries, a savory wild fruit character that runs straight through to the end. The structure frames the flavors with gentle spice that tightens around the wine and lasts. 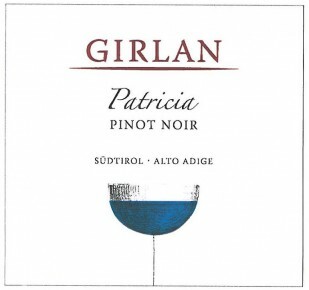 A compelling Pinot Noir, it is an excellent choice with all meat dishes as well as grilled salmon. After destemming and gentle pressing, the grapes are taken to steel fermenting vats (100 hl), complete with pumpover system. Maceration on the skins lasts 10 to 15 days. After fermentation (100% malolactic) the wine is aged for 15 months in French barriques and large oak casks. It then rests for another 6 months before being placed in the market.